1. a small shelter for a dog. Well Ladies and Gentlemen, it's almost here! VALENTINE"S DAY: a day to celebrate love, friendship, and most importantly, a day to bring a smile to the face of those special people in our lives. Puppet Heap is truly excited to offer you ONE LAST CHANCE to give a truly unique gift to one of those special people on this imminently approaching Valentine holiday. 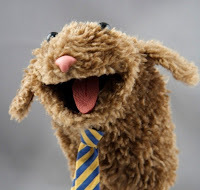 The "TOBY THE DOG" Hand Puppet has been beautifully hand crafted by the talented folks here at Puppet Heap. We take great care in our work, and hope to provide you with a one of a kind piece that is not only built to last, but also happens to be ridiculously adorable. At the heart of everything we do here at the HEAP is the profound spirit of PLAY. We hope to share this spirit of play with you and those special people in your life over this holiday season. Adopt Toby today by visiting the SHOP on our website or ETSY.